We are starting a new piece where every Monday we are going to give you our Top 5 random sports videos that we think you’d love. These videos will be an assortment of the best, worst, most amazing, nostalgic, throwback, funny, and even things that you didn’t even know existed sports related videos that we could find. This isn’t a collection of the best sports videos from the past week like you’ll see on other sites. We are better than that. This is unique so we’ll be giving you something fresh every week. Barry Sanders carves up the Dallas Cowboys defense like a Thanksgiving day turkey. My favorite part was #75 on the Cowboys, who was supposed to try and tackle Sanders, standing there watching as Sanders shake and bakes his way past him. This is the same type of tackling that you typically see at Clemson, West Virginia, or Baylor. 6 foot 1 Kevin Johnson shouldn’t be able to throw one down on 7 foot 3 Mark Eaton who can touch the rim without jumping, right? Wrong. KJ has some mad up’s and tomahawk’s one on the Utah Jazz mountain man. KJ also shows off his mad dunking skills when he absolutely posterizes Hot Rod Williams. I am really jonesing for some NHL hockey and since the league is locked out I figured watching one of the worst shoot out attempts ever was a nice consolation prize. What makes Devin Setoguchi’s shoot out fail that much better is the fact that he did this with the game on the line. Can you imagine being a Minnesota Wild player or fan and having your game end this way? That’s brutal. A few weeks ago I captured the best sports themed Halloween costumes that included a group of hot chicks dressed up as WWF wrestlers. I was absolutely blown away by this costume as not only were the girls easy on the eyes but the craftsmanship of their costumes was top notch. Well I would like to revoke their title as greatest wrestling costume ever and give it to these two guys. What did these guys dress up as? Big Van Vader and Oz. To the average joe these may be no more than elaborate halloween costumes. To the old school wrestling fan these are beyond amazing especially because of the niche wrestlers they chose. Here is Big Van Vader’s debut and here’s the one for Oz to give you a little context. Can you imagine how hard it would be to create that Vader helmet? I’m no Bob Villa so no way I could do it. As for Oz, I’m just floored that they were creative enough to come up with his character as their costume. That’s some deep wrestling knowledge there. 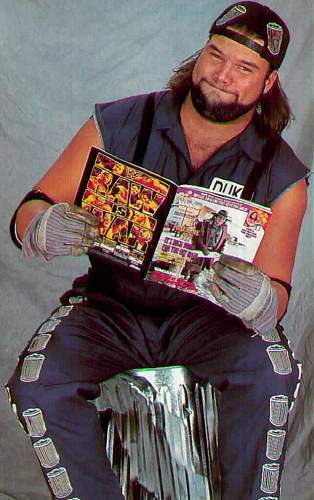 In case you didn’t know, Oz (which was one of the worst angles ever and only slightly better than Duke the Dumpster Droese) was played by Kevin Nash, the same wrestler that was part of nWo, was Big Daddy Cool Diesel, and Vinny Vegas. Grantland recently did an article/interview with Kevin Nash that gave you a behind the scenes look at his wrestling life, how he became a wrestler, and what he’s up to now. I highly recommend it as it was a very interesting read. One last point about this video. It’s not shocking that there is a lack of females in this video and by a lack of females I mean there are none. This NBA video is titled “last line of defense” and is nothing but NBA superstars rejecting shots. As usual I really enjoyed the late 80’s/early 90’s fan montages and the amazing clothes that they wore. It’s almost like Cliff Huxtable was the personal stylist for everyone. I feel like fan enthusiasm now is only about 50% of what it used to be back then. When James Worthy would hit an up and under the crowd would go into a mini frenzy like they just won free Big Mac’s because the team scored 100 points. The Manute Bol block party at the end is the highlight of the video.